From its inception in 1917 up to the release of its first photographic lens in 1933, Nikon focused on the research and development of optical glass, as well as the production of binoculars, microscopes, telescopes, and other optical instruments. This later culminated in the design and development of the company’s early photographic lenses, which were designed with the help of German engineers. The Birth of Nikon: Nippon Kogaku K.K. (Japan Optical Industries Co., Ltd.) is created through a merger of the Optical Instruments Department of Tokyo Keiki Seisakusho and the Reflecting Mirror Department of Iwaki Glass Manufacturing. This company would later be known as Nikon. First Manufacturing Plant: Nippon Kogaku K.K. completes construction on the Oi Dai-ichi Plant (now referred to as Oi Plant) and begins pouring their efforts into optical glass research. Development of Nikon’s First Photographic Lenses: The company releases Anytar to the public, making it available in focal lengths of 7.5cm, 10.5cm, 10.7cm, 12cm, 15cm, and 18cm. It came to fruitrition with the help of world-renowned German engineers and with microscope designer Heinrich Acht at the helm of this project’s design department. Anytar is patterned after Tessar, which was then the standard of high quality photographic lenses. Optical Glass Mass Production: In order to improve glass quality and produce results that rival optical glass from other countries, the company establishes optical glass mass production through research and development, as well as rigorous testing. NIKKOR Brand Name: The name NIKKOR, which was created by combining the “NIKKO” abbreviation of the company name with the letter “R” (used as a suffix for the names of photographic lenses at the time), is adopted as the brand name for the company’s lenses. The name was registered as a trademark in the same year. Nikon’s First NIKKOR Lens: Aero-NIKKOR, the first lens designed by the company for aerial photography, becomes the first line of lenses under the newly established NIKKOR brand name. In the decades that followed, Nikon focused on expanding its cameras and lenses to address a variety of niches. In this regard, they also started reaching out to more people through the founding of clubs and by creating contests meant to hone and discover the skills of Nikon users. This initiative also aimed to bring camera enthusiasts together and promote photography culture. Nikon Brand Name: The company, which was still known as Nippon Kogaku K.K. at the time, begins using “Nikon” as a brand name for their cameras. First Nikon Camera: Nippon Kogaku K.K. introduces the Nikon Model I, which was the first camera to be released under the Nikon brand name. It was originally just called “Nikon” but was later changed to “Nikon Model I” to distinguish it from subsequent camera models. Creation of Nikkor Club: The Nikkor Club is founded as an international organization by world-renowned photographers, top photographers from Japan, novelists, scholars, and even film actors. Its purpose was to connect users of NIKKOR lenses from all over the globe. The Nikon SP: The company releases its signature rangefinder camera, the Nikon SP, which was a flagship of rangefinder cameras in the country. It became one of the most highly acclaimed professional cameras at the time and won the grand prix at the World Expo held in Brussels in 1958. 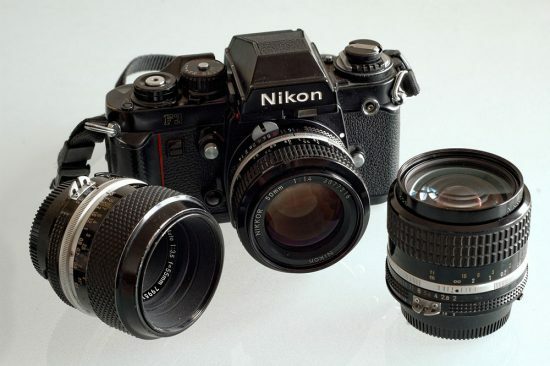 First Interchangeable Lens SLR: The company releases the NIkon F, which was the first interchangeable lens camera of its kind. It introduced the consumer to many world-first features, including the practical application of a motor drive and an exposure meter fully coupled with the aperture. It was positioned in the market as a high-end SLR camera. World’s First Telephoto Zoom Lens: In the same year, Nippon Kogaku K.K. released the Auto NIKKOR Telephoto-Zoom 8.5 – 25cm f/4-4.5—the world’s very first telephoto zoom lens for still photography cameras. Ultra Micro-Nikkor: Nippon Kogaku K.K. releases its line of Ultra Micro-NIKKOR optical lenses, which took the world by storm due to the fact that it had the highest resolution of any optical lens in the world at that time. First Weatherproof Camera: The company releases its first all-weather camera, which was called the NIKONOS. This camera was designed to withstand corrosion, water, and pressure. First Nikon Photo Contest: The company holds the first Nikon Photo Contest, then known as Nikon Photo International, to uphold photography culture and promote interaction between photography enthusiasts from all over the world. Production of Cameras for NASA: The American National Aeronautics Space Administration (NASA) commissions specially designed, space-ready cameras for their Apollo 15 and 17 missions. Nippon Kogaku K.K. then creates the Nikon Photomic FTN, which was constructed to withstand the extreme environments of space. The Nikon F2: Nikon releases the iconic Nikon F2, which was a reliable, easy-to-use, and feature-packed camera heavily patronized by professional photographers, especially newspaper and magazine photographers of that decade. Development of Extra-Low Dispersion Glass: The company begins developing extra-low dispersion glass, which is widely used in today’s modern lenses, for NIKKOR lenses. World’s First Extra-Low Dispersion Lens: The NIKKOR-H 300mm F2.8, which was the first lens to use extra-low dispersion glass, was released. World’s First Wide-Angle Zoom Lens: Nippon Kogaku K.K. releases the world’s first full-fledged wide-angle zoom lens—the Zoom-Nikkor 28-45mm f/4.5. World’s First Titanium Exterior SLR: The Nikon F2 Titanium Uemura Special, the world’s first titanium exterior SLR camera, is developed and released to meet the needs of renowned Japanese adventurer, Naomi Uemura, for his trip to the North Pole. Nippok Kogaku K.K. continued developing more cameras and lenses to expand its product base. It was during this period the the company focused on the integration of autofocus and the development of its first digital cameras. This era in the company’s long history also bore witness to certain major changes in the camera’s aesthetics, logo, and other branding elements, which would impact Nikon’s corporate and market identity in the years to come. The Nikon F3: The company adds another interchangeable lens SLR camera to the Nikon F line—the Nikon F3. It offered some the latest electronic technologies at the time and boasted of many world-first features, such as electronic shutter control and built-in through-the-lens (TTL) metering. The Iconic Red Line: A new design, conceptualized by Italian automotive designer Giorgetto Giugiaro, is introduced with the Nikon F3. Aside from the elegant new aesthetic, it bears the iconic red line that we still see in modern Nikon cameras today. First Compact Camera: The company markets the Nikon L35AF, its first compact camera. It was also called the “One-Touch” in the US. Development of Autofocus Mechanism for SLR Cameras: Nippon Kogaku begins development of the autofocus mechanism for SLR cameras and subsequently releases the Nikon F3AF. First SLR with Built-In Autofocus: The Nikon F-501 is released. It was the first Nikon SLR camera to have its autofocus mechanism controls built into the body. World’s First Lens with Built-In CPU: The company introduces the NIKKOR 50mm f/1.8S, which was the very first lens in the world that had a CPU built into its body. Nippon Becomes Nikon: Nippok Kogaku K.K. undergoes rebranding to help establish and strengthen the brand globally. Due to the widespread reputation of the Nikon camera brand name, the company drops the name it has operated under for the past 70 years (Nippon Kogaku K.K.) and starts using the corporate name of Nikon Corporation. Nikon also starts using the Nikon logo and logotype to reinforce the brand’s identity domestically and globally. The Nikon F4: The newly rebranded Nikon releases the fourth installment in their highly popular line of F-series SLR cameras. Another world first, the award-winning F4 is the first SLR camera to feature a vertical sensor for metering. First Underwater Camera: Nikon releases the NIKONOS RS—the world’s first underwater SLR camera, which allows autofocus shooting underwater. Designed with water contact optics, the Nikonos RS was a useful tool for the scientific study of underwater conditions and species. 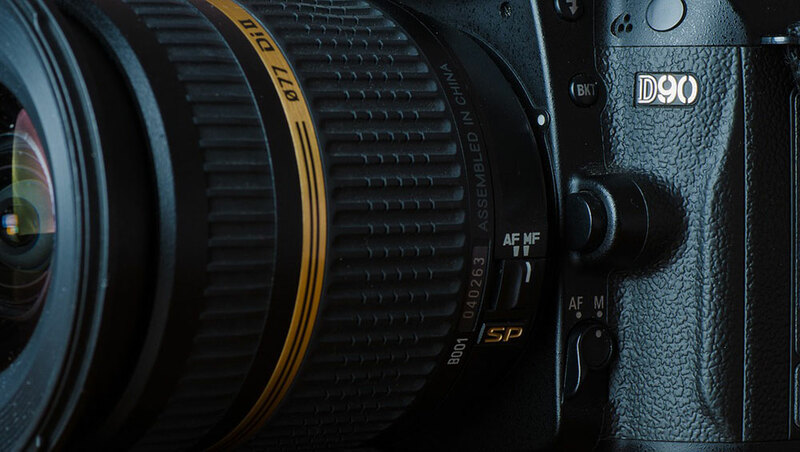 Digital SLR-Type Still Cameras: The Nikon E2 and E2s, developed in collaboration with FUJIFILM Corp, provided photojournalists, studio photographers, and forensic documentarians with the efficiency needed in producing high-quality photos for their jobs. These cameras came with a Reduction Optics System and could be used with most F-mount lenses. First Digital Compact Cameras: The company markets their first digital compact cameras—the Nikon COOLPIX 100 and COOLPIX 300. The former provided users with the option of connecting to the computer through a PC card slot to allow for direct data transfer data. The latter, meanwhile, featured a touch-panel display, which could be operated using a special stylus pen. World’s First Zoom Macro Lens: Nikon releases the AF Zoom Micro-Nikkor 70-180mm f/4.5-5.6D ED, which was the world’s first zoom macro (or micro, as Nikon describes them) lens. The Nikon D1: Nikon’s flagship professional DSLR camera is released. The Nikon D1, an interchangeable-lens DSLR camera targeted towards professionals, was packed with plenty of world-first features such as integrated control of metering and white balance and tone compensation. It also offered exceptional image quality and camera functionality at a highly competitive price (about three times cheaper than those of Nikon’s competitors). Up to this day, the company continues to create professional DSLRs based on this model, with the latest being the D5. 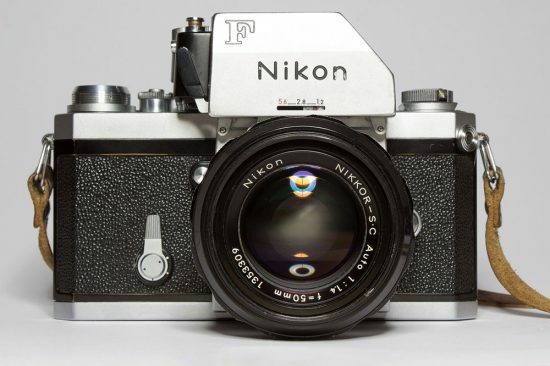 The Last of the Nikon F-Series: As digital photography gained popularity, the interest in film SLR cameras began to wane. In 2004, the company releases the Nikon F6, which was to be the final installment in their highly popular flagship Nikon F-series line. The F6 combines the well-loved features of the previous Nikon F cameras and the latest technological advances during this time. World’s First Compact Camera with WiFi: Nikon releases the COOLPIX P1, its first compact camera with built-in WiFi—the first of its kind in all the world at the time. World’s First Lens with Nano Crystal Coat: The AF-S VR Nikkor ED 300mm f/2.8G IF-ED is another world first from the brand, as it is the first NIKKOR lens to feature the popular nano crystal coating. World’s First Compact Camera with Face-Priority AF: Nikon unveils the COOLPIX 7900. It is a notable product from the brand as it is the first compact digital camera to feature face-priority autofocus, which allows the camera to automatically detect faces for sharper focus. World’s First DSLR with Video Capture: The capability to record video is a familiar feature in today’s modern DSLR cameras, but it all started with the Nikon D90. In 2008, Nikon releases the 12.3-megapixel DSLR camera, which was the first of its kind to feature video recording ability. World’s First Digital Camera with Built-In Projector: Proving that they never stop innovating, Nikon releases the COOLPIX S1000pj—the first digital camera in the world to feature a built-in projector. Nikon in the International Space Station: NASA once again taps Nikon to provide them with cameras and lenses, this time to record images in the International Space Station. From 2009 to 2010, the company provides NASA with several D3S and D3X DSLR cameras, as well as various interchangeable lenses such as the AF-S NIKKOR 14-24mm f2.8G ED and F-S NIKKOR 400mm f/2.8G ED VR. First Advanced Cameras: The company combines the compact camera and the DSLR with the Nikon 1 J1 and Nikon V1—Nikon’s first advanced digital cameras. These are compact digital cameras that allow for interchangeable lenses. The Nikon D4: Nikon markets one of its most outstanding DSLR camera models, the Nikon D4, which significantly improved on the Nikon D1 to help meet the shooting demands of both amateur and professional users. At the time, it was Nikon’s fastest and most feature-packed DSLR model, making it a great choice for demanding photography applications, such as sports and action photography. World’s First Waterproof and Shockproof Digital Camera: Nikon markets the Nikon 1 AW1—the first digital camera (with interchangeable lenses) that could be used underwater. First Compact Digital Camera with Telephoto Zoom: Nikon releases a compact digital camera that allows extreme telephoto zooming. With a 83x optical zoom lens, the COOLPIX P900 gives the user the portability of a compact digital camera and the diverse shooting options of a telephoto lens. It also features a fast maximum aperture and one Super ED (extra-low dispersion) lens element. The Nikon Museum: To mark Nikon’s 100-year anniversary, the company opens the Nikon Museum in Shinagawa, Tokyo. Nikon’s Most Advanced Professional DSLR to Date: On its 99th year, Nikon comes out with their most advanced professional DSLR to date. The Nikon D5, which is considered the fastest and most precise DSLR out of anything the brand has in their vast camera lineup, boasts of highly advanced features such as 12fps continuous shooting with full-time autofocus (AF) and auto-exposure (AE), an expanded sensitivity range that goes up to ISO 3280000, and 4K UHD video recording at 30fps. 100 Million Lenses: Nikon hits an impressive milestone in the company’s century-long history after reaching the 100 million-mark for the total number of NIKKOR lenses produced for their interchangeable lens cameras. First Action Cameras: Nikon launches its first line of action cameras. The KeyMission 360, KeyMission 170, and KeyMission80 are all equipped with water-resistance, impact-resistance, and the world-renowned image quality that people have come to expect from Nikon. And there you go—100 years of revolutionary optical instruments from one of the world’s largest and most beloved camera brands. In celebration of the company’s first 100 years, Nikon has come out with a range of special 100th Anniversary editions of select cameras, lenses, and accessories. These special edition products all bear Nikon’s 100th anniversary logo. 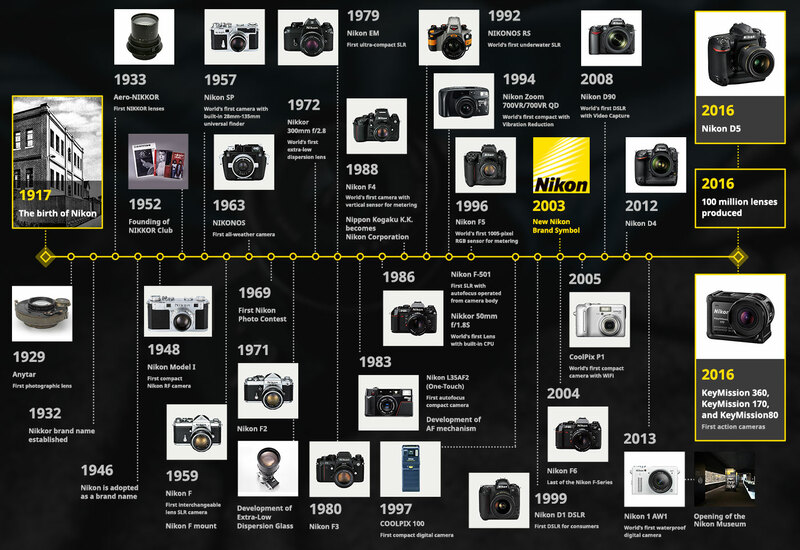 This entry was posted in Other Nikon stuff and tagged 100 years Nikon, Nikon history. Bookmark the permalink. Trackbacks are closed, but you can post a comment.